The Belfast Open saw a fair crowd of 18 players and 1 ghost turning out to do battle September 25-26 in Belfast, Ireland. The winner was David Phillips 1d of the Isle of Man, who gracefully lost his last round game thus creating a four way tie for second. Claas Roever 1k and James Hutchinson 1k shared second place on SOS, just ahead of Daniel Paraschiv 1d and then Colin MacSweeny 2k. On 4 wins was Julian Dragomir 7k, visiting from Romania, and Costin Camarasu 15k. Quzhou-Lanke Cup Semifinalists. 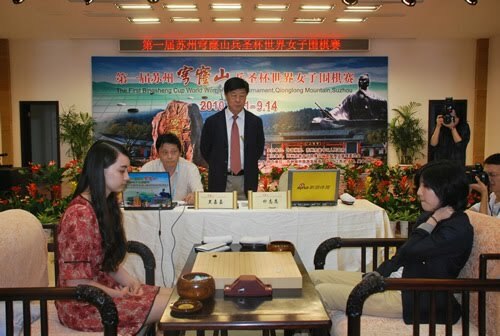 Xie He 8P, Zhou Ruiyang 5P, Jiang Weijie 5P, and Yang Dingxin 2P each won their respective 3rd round matches in in the 3rd Quzhou-Lanke Cup and now advance to the semifinals, which will be played on September 28th. Iyama Yuta 3-0 in Meijin. Iyama Yuta 9P defeated Takao Shinji 9P by resignation in the third round of the 35th Meijin. Yuta has won all of the first three matches in the best of seven series. The next round will be played on October 6th and 7th. Dan Smith 1d (l, in green shirt) took first place in the September 25 Fish Amnesty Tournament in Chicago, IL. Smith topped a field of 26 players. “We were honored to have the entire Central Region Board of Directors at this tournament, Laura Kolb and Lisa Scott,” reports TD Bob Barber. “Lisa has moved to Chicago to study, and plans on a good long stay. Joining her from the University of Chicago was Shanthanu Bhardwaj, who bicycled the 30 miles to the tournament. And went on to win half his games. Perhaps the two of them will be the core of a vibrant go scene on the South Side, something we’ve always lacked.” Thanks to the generosity of Chris Green, Barber adds, “each participant was given a copy of ‘Perceiving the Direction of Play’ from Hinoki Press. Chris plans to repeat this performance, with different titles, for upcoming tournaments. So, in effect the entrance fee will approach zero.” Barber also noted that “Lisa Scott will also co-direct the 2011 U.S. Go Congress in sunny Santa Barbara, CA. If half of what she told us is true about the site, it will be fabulous.” Finally, Barber extended thanks to Steffen Kurz, “and indirectly to Mark Rubenstein, for sponsoring the pizza and beer party.” Winner’s Report: 1st Place Dan: SMITH, Daniel, 1d (undefeated); 1st Place Hi Kyu: NORMAN, Matthew, 5k; 2nd Place Hi Kyu: KOLB, Laura, 2k; 1st Place Low Kyu: WU, Eric, 16k. The top section of the September 19 Hoboken Open turned into a struggle for the $400 first prize among perennial stars Kevin Huang and Carson Tu, youngsters Lionel Zhang and Andrew Huang, and newcomer Xiruo Liu. 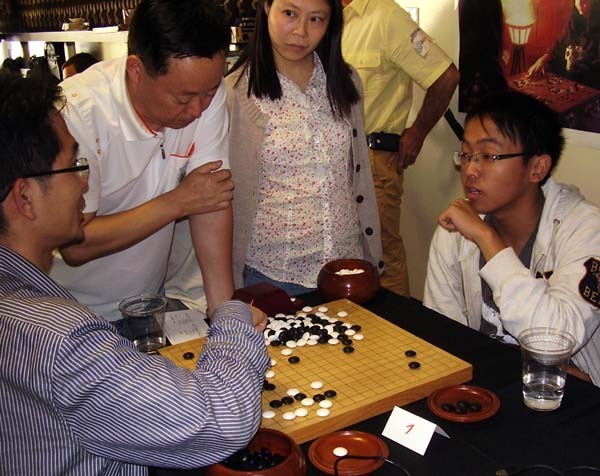 In the third round (r), Zhang outfought Kevin Huang in a tense mid-board capturing race setting up a climactic final round. Kevin Huang beat Carson Tu to tie for first with three wins, while Andrew Huang spoiled Zhang’s chance to get a third win. 47 players participated, with all 3-game and 4-game winners receiving a cash prize plus a book. The tournament was played on the campus of Stevens Institute in Hoboken NJ, against a stunning backdrop of the Manhattan skyline. Organized by Larry Russ, directed by Steve Bretherick. Special thanks to Slate and Shell for sponsoring book prizes and to Paul Matthews for Accelrat technical support. Winners: Top section: 1st (tie) – Carson Tu 7d, Kevin Huang 8d; 3rd (tie) – Lionel Zhang 6d, Andrew Huang 6d, Xiruo Liu 6d; 4-game winners: Marc Palmer 1d; 3-game winners: David Byrne 1d, Justin Ching 1k, Afa Zhou 2k, Masaaki Hamaguchi 2k, Eric Wu 2k, Barbara Huang 8k, Jessica Huang 22k, Joanne Huang 19k, Sean, Huang 27k, Diana Huang 25k, Leo Huang 26k. 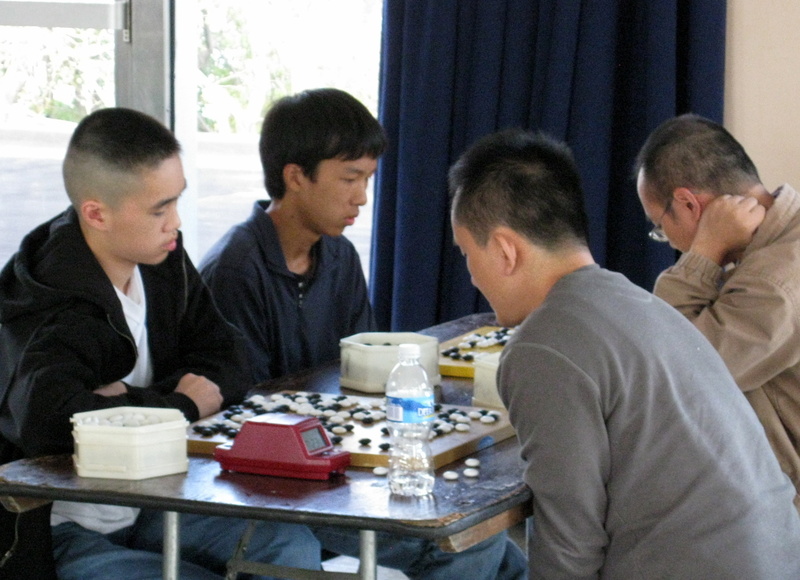 photo: top boards play Round 3: L-R, Andrew Huang, Lionel Zhang, Carson Tu and Kevin Huang; photo courtesy Larry Russ. Click here for more photos. 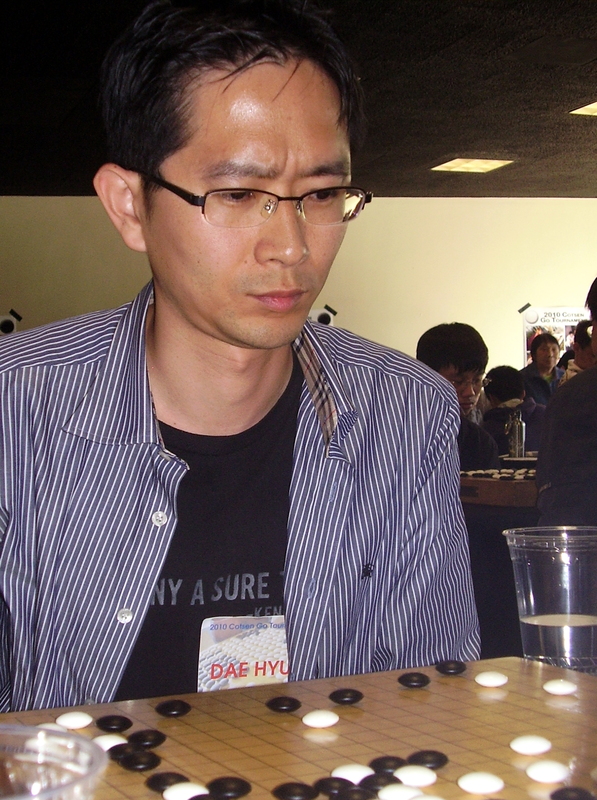 Dae Hyuk Ko 7d (l) won the Cotsen Open last weekend in Los Angeles, California, besting a very tough Open section in which a lot of hard-fought games were played over the course of the two-day tournament. More than 150 players turned out for the 20th annual competition, one of the biggest and richest on the annual American Go Association tournament calendar. The popular event, founded and run by longtime local go fan and entrepreneur Eric Cotsen, is also a unique tournament, the only one to feature free shoulder massages from roaming masseuses, a free catered lunch on both days, a club competition with a $1,500 prize pool and full refund of registration fees to players who attend both days of the tournament. Another highlight was the online pro-pro game Sunday morning between Yilun Yang 7P and Yigang Hua 8P in China, which Yang then commented on afterward. In addition to being available to review player games, Yang ran a competition to correctly solve life and death problems that had players clustered over boards throughout the playing area working on the problems. This year’s tournament also hosted a planning meeting for the 2011 U.S. Go Congress, which will be held July 30-August 6 in nearby Santa Barbara, California and already has close to 100 pre-registered. The American Go E-Journal once again broadcast top-board games on KGS, some of which were commented by Jennie Shen 2P; EuroGoTV also hosted a live video feed of Board 1. RESULTS (Open Section): 1st: Dae Hyuk Ko 7d ($1,000); 2nd: Juyong Ko 7d ($500); 3rd: Deuk Je Chang 7d ($250); 4th: Curtis Tang 7d ($125); 5th: Seung Hyun (Kevin) Hong 7d ($75); 6th: Rui (Ray) Wang 7d ($50). A 3d-5d: 1st Haibo Zhou $500; 2nd Brett Kelly $250; 3rd Jack Shih $125. B 1k-2d: 1st Aaron Ye $400; 2nd Ross Wolf $200; 3rd Sammy Zhang $100. C 2k-4k: 1st Clark Brooks $500; 2nd Alex Chau $250; 34d Jay Chan $125. D 5k-8k: 1st Roger Schrag $200; 2nd Alf Mikula $100; 3rd Ezana Berhane $60. E 9k-11k: 1st Daniel Davis Jr. $100; 2nd Jiayue Li $80; 3rd Reese Anschultz $50. F 12k-18k: 1st Gordon Castanza $80; 2nd Scott Nichols $60; 3rd Luis Armendariz $40. G 19k+: 1st Shuai Weng $60; 2nd Bryan Liu $40; 3rd Alex Ledante $30. Club prize: 1st Santa Monica Go Club $1000; 2nd Orange County Go Club $300; 3rd Yu GO Go Club $20. The September 18 NOVA Go Club Back to School Tournament drew 33 players, including “a whole carload of Hokies who came all the way from Virginia Tech and joined the AGA for the first time,” reports organizer Gary Smith. Zhenying Gu 5d was undefeated in the 4-round tourney in Arlington, VA and won place first in the upper dan division. Tournament Director Edward Zhang again organized a team tournament, with the Capital Go Club walked away with the prize money, while NOVA and nOObpunzors tied for second. RESULTS: 1st: Zhenying Gu 5d; 2nd: Binquan Wang 5d. Lower Dan Division; 1st: Jian Liu 1d; 2nd: Jimmy Yang 4d. 1-2 Kyu Division: 1st: Hua Lin 1k (undefeated); 2nd: Greg Pongracz 2k. 3-5 Kyu Division: 1st: Kevin Chin 3k; 2nd: Sam Zimmerman 5k. 6-12 Kyu Division: 1st: Mike Lash 6k (undefeated); 2nd: Garrett Smith 11k. 13-30 Kyu Division: 1st: Tariq Khan 29k; 2nd (tie), Tristan Tran 17k; 2nd (tie), Christopher Tolley 18k. 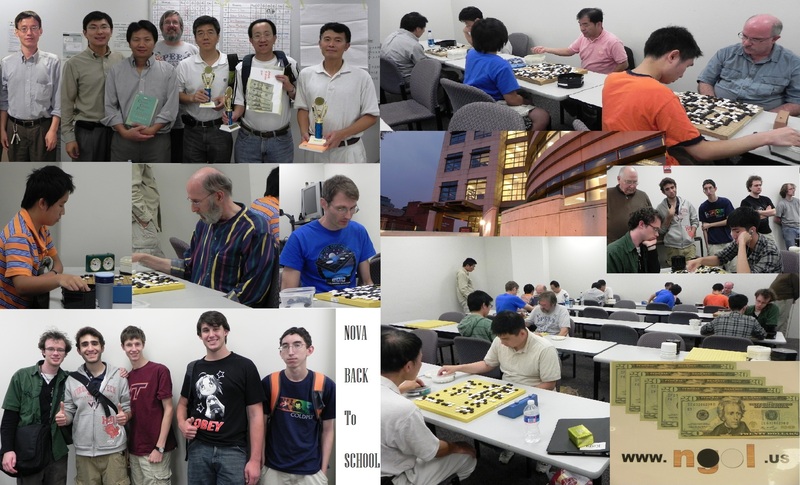 photo collage by Edward (Zhiyuan) Zhang: left top, Capital Go Club, left to right, Hua Lin 1k, Zhiyuan Zhang 6d (Tournament Director), Binquan Wang 5d, Garrett Smith (NOVA President), Zhenying Gu 5d, Tao Wang 5d, Jian Liu 1d. left middle: Jimmy Yang 4d, Allan Abramson 3d, Greg Pongracz 2k. left bottom: the Virginia Tech Team, who drove 4 hrs to attend. Longtime go organizer, author and teacher Milton Bradley passed away Saturday after a long illness. “Milt’s passion for go was unstoppable,” said American Go Association President Allan Abramson, who had played a weekly game online with Bradley over the last year. “We hope that the enormous amount of energy he put into encouraging go players is inspiring to a whole new generation of teachers. Milt will be missed.” An avid chess player, Bradley’s interest in go was sparked “after I read the first few issues of the American Go Journal at the Marshall Chess Club in 1950,” Bradley told the EJ earlier this year. “At that point I immediately — instinctively, it seems — grasped go’s depth and profundity, as well as its great superiority to chess, which until then had seemed to me to be the perfect game.” One of the AGA’s earliest members – he was AGA member 157 – Bradley’s 60-year go career highlights included playing Edward Lasker in 1952, and Honinbo Kaoru Iwamoto 9P several times in his simuls at the NY Go Club in the late 1950′s. Bradley – a mechanical/industrial/quality control engineer – had “a passion to make go both more popular and accessible,” and his efforts not only included teaching over 1,000 beginners, but unique promotional ventures like “playing go in the front window of the Takashimaya Department store on New York’s prestigious Fifth Avenue,” (he’s at left in the photo) and several years penning a go column for the national Mensa Bulletin. He was also a prolific author, whose titles included Go For Kids, New Go Proverbs Illustrated and his free online Improve Fast In Go. Click here for more on Bradley’s long and fascinating career, including photos and links to his publications. Won Sungjin Advances to Myeongin Finals. In the 38th Myeongin semifinals, Won Sungjin 9P defeated Kang Dongyun 9P by resignation to take the series 2-0. Won will now face either Lee Changho 9P or Park Yeonghun 9P in the title match. This could certainly be a repeat of last year’s title match between Won and Lee, when Lee prevailed by winning the title series 3-1. Park has been playing very strongly of late, though, so it wouldn’t be at all surprising if he defeated Lee in their semifinal bout, which begins on September 29th. Kuksu Round 2 Results. In the second round of the 54th Kuksu, Lee Sedol 9P and Heo Yeongho 7P advanced by defeating their respective opponents, Mok Jinseok 9P and Hong Kipyo 4P. 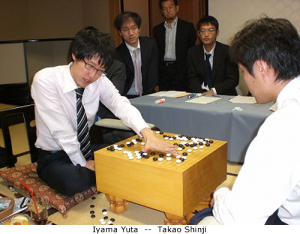 Iyama Yuta takes 2-0 lead in Meijin. Iyama Yuta 9P handed another defeat to Takao Shinji 9P, this time by 5.5 points, in the second game of the 35th Meijin title match. Iyama and Takao have both held the title only once, Takao in 2006 and Iyama, who is the current title holder, in 2009. The third game will be played on September 22-23. Lee Sedol wins Price Information Cup. Lee Sedol 9P defeated Lee Changho 9P by resignation in the second game of the 6th Price Information Cup title match, sweeping the series 2-0. This is the third Price Information Cup title for Lee Sedol, as he won it in 2006 and 2007. Park Jieun wins Qionglong Cup. Korea’s Park Jieun 9P (r in photo) defeated Australia’s Joanne Missingham (Hei Jiajia) 1P (l) by resignation in the 1st Qionglong Cup title match. The Qionglong Cup is an all-women’s international tournament, also known as the Bingsheng Cup. The winner receives 200,000 RMB (approx. $30,000) while the runner-up receives 70,000 RMB (approx. $10,000). 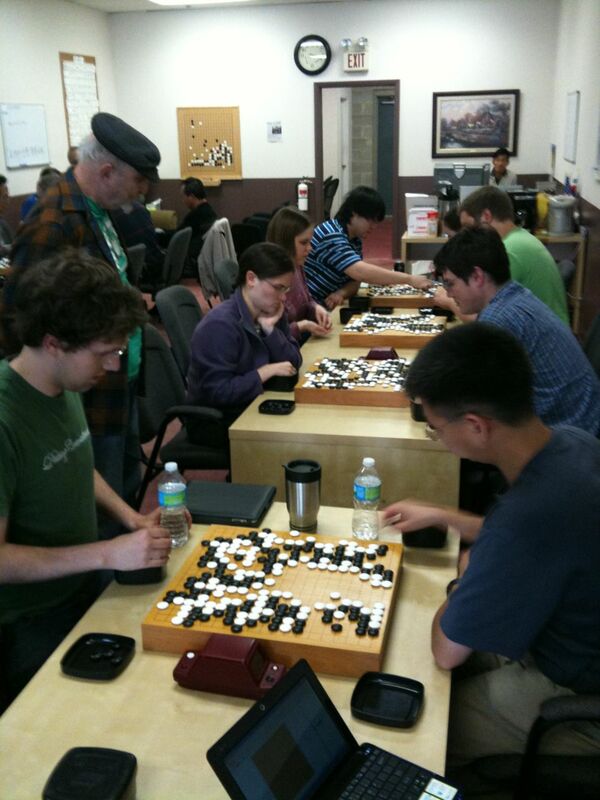 Twenty six kids and adults played in the September monthly ratings tournament this past Saturday in Palo Alto, CA. Jean-Baptiste Chaubet 1d (right in photo), visiting from France, led the field of a dozen dan-level players with three wins. In the kyu division, Eric Hoffman 2k, Jay Chan 3k, Roger Schrag 5k, Tom Rike 6k, and Eric Sumner 17k picked up two wins apiece. Next month’s Bay Area Go ratings tournament is scheduled for October 16 in San Francisco.